I’d written in, called to find the appropriate editor to speak to and pretty much hassled Mrs A for a couple of weeks. Football commentary had always interested me and although I’d not studied the history of this art form from its inception, it flicked my switches. I, like many, would turn the sound off on the TV and give it a go myself as a kid. Following God’s ‘beautiful game’ as a profession was a pipe dream back then although I should have realised there’d be some kicks in the teeth along the way; I never expected what happened on Sunday 12th May 2013. Mrs A at Three Counties in Luton (I moved a lot from the age of 13 when I left the East Midlands and lived with my father) offered me some work experience; a week’s break from selling TVs in Dixons St Albans. I loved it, Simon Oxley was The Hornets reporter and Sport Editor, he took me under his wing and after a bit of sales patter I secured a role on the Saturday Sport team (whilst flogging CoverPlan Monday to Friday for our favourite electrical retailer) answering the phones and gathering non-league scores. LOVED. IT. 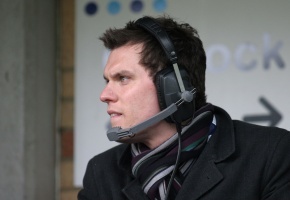 A couple of seasons in, and allowing me some time to listen and learn, the Wycombe Wanderers reporter moved on they offered me the chance I’d been waiting for, the hours of off-air practice I’d put in with the team paid off; without an ounce of nerves I covered The Chairboy’s home game against Cambridge United, they said I’d done a good job. For the following 4 seasons I forged working relationships with Tony Adams, John Gorman, Paul Lambert, Martin Allen, Paul Ince and Roberto Di Matteo amongst otheres, all without any problems or snubs, although JG did take umbrage with a question or two along the way but got on with it as most managers do. The experience I gathered over those seasons with reports and full commentary put me in a great place to win the vacancy at BBC Radio Leicester. The prize? To report on the club I supported as a boy and I was the best candidate. It’s an honour to call every game The Foxes play and I never forget that, but in the second leg of the play-off semi-final I had a minute of sorrow and it’s tough to admit. I’m impartial, give the club warranted criticism, hold them to account and try to establish the truth without being scared to air it but I realise what our audience want, success for the club. BBC Radio Leicester want the same but I never feel like a fan on the air, I can’t, I have a job to do. Apart from in the 96th minute on that day. The Allez Les Bleus call had gone down incredibly well following the win against Nottingham Forest a week earlier, Leicester’s first in over 40 years in the league at The City Ground. Anthony Knockaert had scored the goal on that day and stepped up to take a soft penalty in the 96th minute at Vicarage Road to send The Blue Army to Wembley. I was cool, composed and ready to see it in; I expected it to go in. It didn’t. My voice was controlled as an injured Almunia pushed the ball away, you never know whether there’s going to be a rebound and your vocal chords have to move into another gear – “always leave your voice somewhere to go” the BBC’s commentary coach tells me. The rebound is saved. In that split second my head told me “save your voice, there’s extra time and maybe penalties to come” Little was I to know that a sucker punch goal for Watford, yes the team of my previous employers with all my former team mates next to me in the commentary box, cue cries of “noooo, noooo” as Troy Deeney broke the hearts of every Leicester fan around the globe – I continued with my job, describing what was going on but inside I was struggling. I have a 6 year old son who the previous day had watched the FA Cup Final with me and been told that if Leicester win tomorrow he’d be going to that stadium, which looked as big as another planet to his small eyes. “Wow” he said, the pride in his eyes squeezed my heart, “IF” I said, long way to go yet. His Grandad would take him for the day of his life, my 2 heroes together screaming for their club. I couldn’t and didn’t think of him as that sickening goal went in, I couldn’t, I had a job to do. The full time whistle goes and from being a penalty away from Wembley Leicester City’s season is over and now I’m in trouble. As Alan Young sums up the game my thoughts move to the fans, my Dad and my son, I’ve gotta wrap up quickly or I’m a gonner. A quick recap of the 90 minutes and I usually end on the score, as ‘the voice of The Hornets’ Simon Oxley taught me, oh the irony. Words to the effect of “It’s season over for Leicester City” left my mouth, then a small pause…………do I or don’t I? Why not, it’s how I feel “and I’m really sorry” were my final words. Was I apologising to all Foxes fans for what had just happened? Maybe, or was it to my son for not being able to take him to Wembley? Probably. I’m glad my colleagues in the studio moved the programme on with a jingle as I took a second for a breath before ending on the score. The words “on aggregate it’s finished Watford 3 Leicester City 2” did leave my mouth boss but my friends had saved me.